Maybe if Florida St. had a decent kicker to beat Miami, it would have been different. Back in the early 1990s, the college football world watched with pity as folksy head coach Bobby Bowden repeatedly lost to Miami to cost them multiple national championships. 1991 was a classic example. The Seminoles were the favorite that year to win it all, played dominantly all year long and came into the Miami game 9-0 and ranked #1. Yet their kicker missed a 34-yard field goal—Wide Right you may recall if you are reading this—as time expired and Miami won, 17-16. The next year was the same, except a missed FG—Wide Right, of course—cost them a chance to tie Miami. Then 1993 came along. Bobby Bowden had his best team yet it seemed and dispatched of Miami—finally!—early in the year. 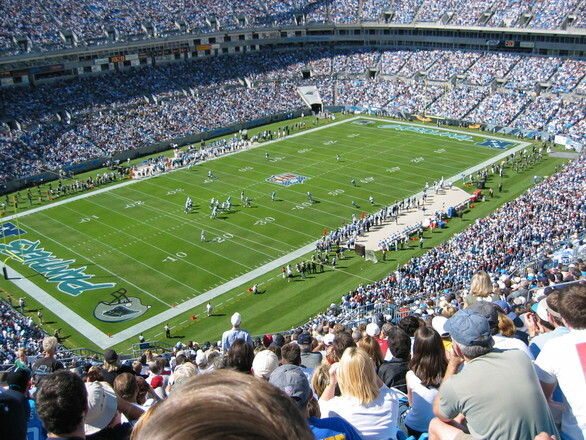 They were boat racing the ACC, winning against recent conference champions Clemson and Georgia Tech by scores of 57-0 and 51-0. With the curse of Miami behind them, nothing could stop the pollsters from finally voting Bobby Bowden, I mean FSU, #1. As November approached, one more huge game loomed. 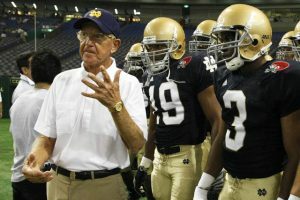 Notre Dame, led by fiery, witty and extremely accomplished head coach Lou Holtz, stood undefeated as well. And when the week of the game approached, the teams stood 9-0 and 10-0 and were ranked #1 and #2 in the country. It was billed, as college football games periodically were back then, the “Game of the Century”. I don’t think many people were giving Notre Dame much of a chance, however. Even at home. Not only was FSU winning games by 50 points but they were the sentimental favorite since Bowden had come so close before and still hadn’t won it all. With an offense guided by Mark Richt and eventual Heisman winner Charlie Ward, it seemed that fate was on his side. The environment for the game could not have been more picture perfect. 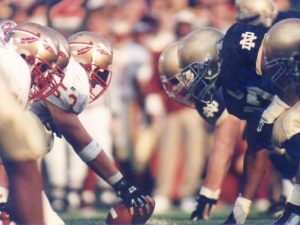 Playing in Notre Dame Stadium, where the ghosts of Fighting Irish past stood to intimidate every visiting team, 59,000 raucous fans were primed. 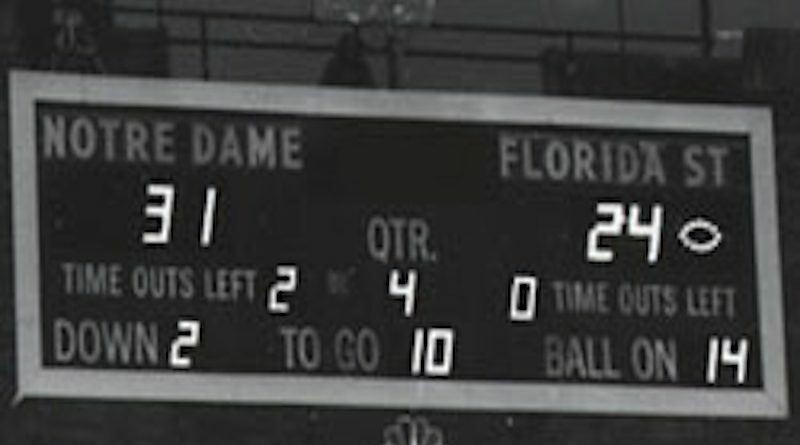 (Back then Notre Dame was the team with all the history: 11 National Championships and seven Heismans. At that point, Florida St had zero of both.) NBC had the telecast and Bob Costas and his golden voice gave a memorable introduction to the game as music from the Rudy soundtrack played behind. It was an immaculate Saturday afternoon for college football between the two top teams in the nation. Notre Dame made it clear quickly that they would not be stampeded like the ACC and Miami were. FSU did indeed score first, and quickly, to go up 7-0. But then Notre Dame punched back and started controlling the line of scrimmage on both sides. Lee Becton gashed the FSU defense over and over again for 122 yards that felt like 172. The Irish defense swarmed Ward and mounted up sacks and turnovers. And ND reeled off the next 24 points. By late in the fourth quarter they led 31-17 and invincible Florida St. was on the ropes. Florida State rallied, behind a lucky bounce on 4th and 20, to pull within a TD. Then after a quick Fighting Irish three and out, they had the ball for one last chance to tie the game. It was not to be, as one of the most familiar images etched in my mind to this day, Ward’s last pass in end zone was batted down. Holtz, as he had so many times with N.C. St., Arkansas, Minnesota and Notre Dame, had engineered a massive upset. Nope. 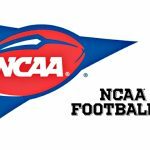 It never is in college football, as champions used to be awarded based on beauty pageants and odd logic as much as on the for on-the-field results. This year was no different. After the game, Notre Dame moved into the #1 spot in the polls. FSU dropped only to #2, ahead of undefeated teams like Nebraska, Ohio St., West Virginia and even Auburn, who was on probation and ineligible for the postseason. 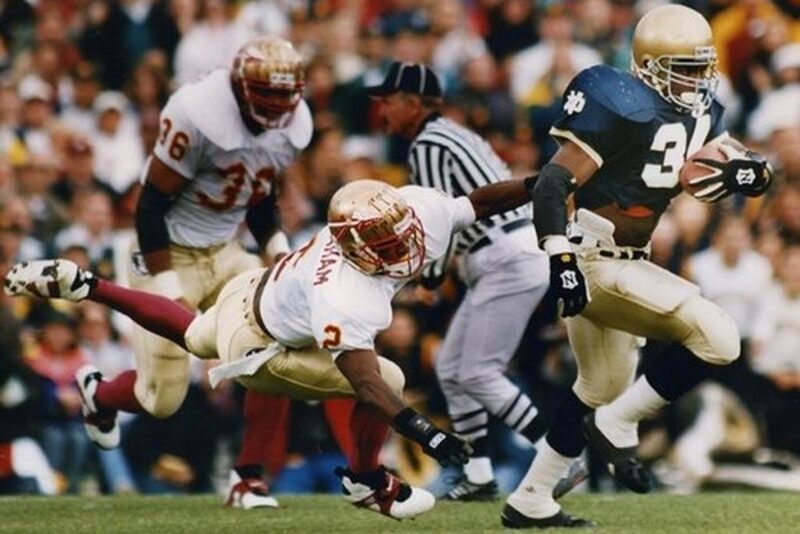 There was already talk of a ND-FSU rematch in the Fiesta Bowl. You could sense even at that point that the Seminoles were basically given a mulligan for the game. It was being spun, even by Florida State brass, that they played the #1 team tough on the road and so they must be the #2 team. If it played out like FSU was lobbying for, Notre Dame was going to have to beat them again. Bowl season loomed and it was apparent that Notre Dame was going to need a myriad of things to break right to win the National Championship. They more or less needed undefeated West Virginia to lose and for FSU to beat undefeated Nebraska in an ugly game in the Fiesta Bowl, while winning their bowl game vs. Texas A&M. And luck of the Irish, it all happened. Notre Dame beat A&M 24-21, Florida throttled WV 41-7, and Florida St. barely scraped by Nebraska 18-16 in a disjointed but thrilling contest, after the Cornhuskers missed a long FG on the last play that would have won it. 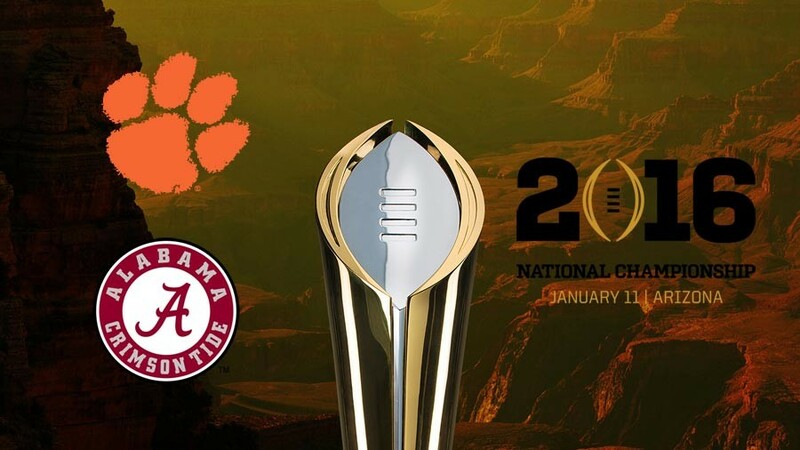 As a result it was clear that only two teams really could stake claim to the National Championship: Notre Dame and Florida State. (Auburn remained undefeated but was de facto excluded for being on probation.) Florida State took 48 of 60 first-place votes in the AP and 36 of 61 first-place votes in the Coaches poll, winning both championships. The argument that the coaches and media seemed to favor was that the two teams had the same record and that the Seminoles had the “better” loss, losing on the road to #2 instead of at home to #12. Holtz’s rejoinder was one of searing logic that, in my opinion, put all of those FSU voters to shame: They had the same record and one team beat the other. Head-to-Head is the most fundamental tie-breaker there is. Most voters ignored it. Adding to Holtz’s ire was that in 1989 a similar scenario played out, except in reverse. Miami and ND both had one loss at the end, and the voters favored Miami because Miami won the game the two teams played. Holtz could not wrap his mind around why things all of a sudden changed four years later and was not shy about expressing it: “I really and truly felt we would win [the championship] when I went to bed,” Holtz said the Sunday after the bowl games. “Even Bobby Bowden said he felt that Nebraska outplayed them. I just felt that based on 1989 and the logic given then, and the head-to-head competition, I felt in my heart there was no way we would not win it.” As time passed he never wavered on this, later adding, “We played Florida State in the season and the game obviously didn’t mean anything. Everybody said it was the game of the century. I guess it was the game of the century if the right team won.” To this day, Holtz considers 1993 a “sort of” National Championship for Notre Dame. 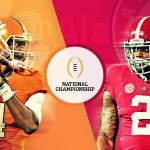 Here’s what gets me as a college football fan, even 25 years later: So often in that era of college football, the two best teams did not play each other and we were left wondering who would win if they did. And typically, they split the two polls and both were given recognition as National Champions. 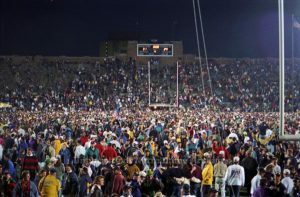 It happened in 1990 with Colorado and Georgia Tech. It happened in 1991 with Miami and Washington. It happened in 1997 with Nebraska and Michigan. It even happened in the BCS era in 2003 with LSU and Southern Cal. Yet in all of those splits, neither team could say of the other, “We beat them on the field where it mattered.” That is not true of 1993. Notre Dame won. And it didn’t matter. In my humble opinion, the vote in both polls was greatly impacted by how much people loved Bobby Bowden. He had never won, so they gave it to him. A similar thing happened the very next year when Nebraska and Penn St. both were undefeated and both polls gave the championship to previously ringless Tom Osborne of Nebraska. So the Game of the Century? More like as meaningless a loss as any in the history of Florida State football. College Football has a history of injustice in determining its champions. To me, this was one of the worst. In my mind, Notre Dame won the biggest game and deserved the championship. Then the game actually would have meant something. Announcer Todd Christiansen losing his mind when a key FSU player left the field to change his cleats. TC basically said in a game of that magnitude you don’t miss plays to worry about your shoes. 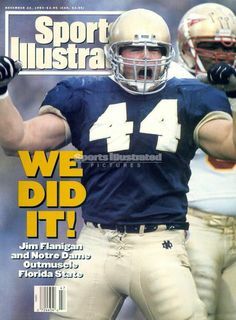 Of course, the follow up SI cover after ND’s loss to BC, “Down Goes #1, Again” and the SI cover at the conclusion of the season, featuring a cheerleader hugging Frier and a headline about FSU finally beating ND – in the polls. With NYD being on a Saturday, I didn’t know the final poll until after church Sunday morning. I do not remember the message that Sunday but I remember being crushed when the final poll was released. Although I was angry then and to this day believe ND deserved the title, I’ll readily admit I didn’t want any part of FSU in a rematch. I guess some justice was served 3 years later when FSU had to face Florida in a rematch for the title and got run off the field. One final note, I do wish more teams scheduled out of conference like FSU did that year. I had a feeling you’d remember great detail. Since I didn’t have a horse in the race, a lot of the specifics escape me but the whole feel of the game was quite obvious. It was very much like UConn vs. Duke in basketball in 99 or the Giants over the 07 Patriots. Like, we know these are the Top 2 teams but one clearly is going to win. And then the game starts and it’s like, OK maybe not. We didn’t know each other back then but when all this happened I was vocally behind FSU. I even did a mock poll at my high school as to whom deserved the title that year and I was trying to convince everyone it was Fla St. Not because they deserved it but because I had this weird rebellion phase in the early 90s where I pulled for the ACC instead of the Gamecocks. When we met at school I probably didn’t have much of an opinion either way. All it took for me to fervently back ND for posterity was for Lou to come coach our team. Man I love that guy. I think these stories need to be told. The next generation needs to know beyond what the lists say. I did not know the Holtz “Game of the Century” quote until you told it to me, either in school or back on the old forums. After reading his autobiography this year it is obvious that while he is humble and folksy in his own right, Lou is hyper competitive and will say what he means. Again, I love that guy. I did not/do not have a rooting interest here, but just have to say how much I enjoyed reading this recap of the entire thing. Well done Gowdy! Thanks! 15-year old Gowdy took sports obsession to the max. It sounds like 16-year old Joey did too. We would have been best friends. Even though marriage has taken some of the sports passion away, I’ll never forget the things I saw in my first 36 years. At the time, I wanted FSU to win, and I was upset when they lost to ND. Looking back, though, I think that title was fixed to give one to Bowden. There was no way they should have won the national title that year. The next year, they fixed it for Osborne, and gave Nebraska both polls when they should have only won one.